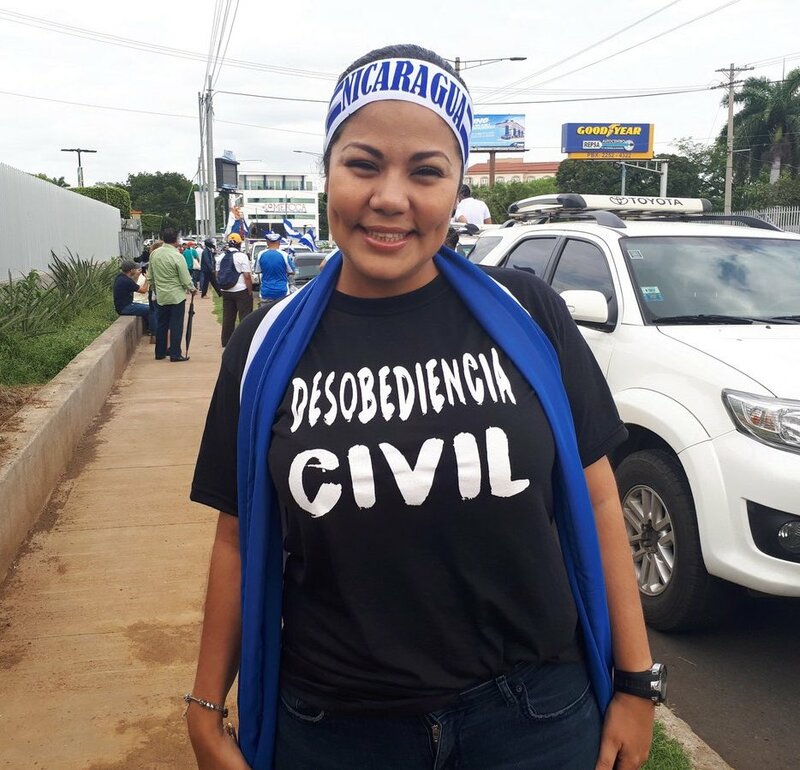 Irlanda Jerez, merchant from the Mercado Oriental in Managua, Nicaragua, and leader of the tax resistance movement there (see ♇ 9 June 2018 ), was arrested by masked police yesterday . She had just spoken at a press conference to announce a 22 July protest march in the Nicaraguan capital. Her current whereabouts are unknown. The Nicaraguan government has been under increasing pressure both from grassroots civil disobedience and from international condemnation of its killings of demonstrators and its use of pro-government paramilitary groups to attack the opposition. This is the fifteenth in a series of posts about war tax resistance as it was reported in back issues of The Mennonite . Today we continue our trek through the 1960s. I refer to the letter in the Dec. 29 issue [see yesterday ’s post] suggesting that Mennonites and others should refuse to pay income taxes used for military purposes.… I am afraid that this program amounts to an attempt to force certain Mennonite beliefs on other people whether they wish to accept them or not… I am afraid that, having the right to practice our beliefs as we see fit, we are showing a growing tendency to be pretty insistent that others be made to do as we see fit also. Paying taxes is one vital link the individual has with society and I question whether we as individuals and Mennonites can afford to sever this link. To do so I fear would be a giant step backwards toward isolationism and the delusion inherent in such a philosophy that we are thereby free from responsibility for what our nation does… If one would refuse to pay taxes as a form of protest (symbolic) without deluding himself about his guilt and involvement (thus a protest even against himself) I could see a case for it. It is good to hear an effort is being made to allow us to pay an alternate tax, but won’t this remove the potency of a resounding “No” just as the law permitting alternative service did? This points out the necessity of opposing the evil as a whole, not just opposing a contributing factor. If my taxes are used 100 percent for peace, my neighbors’ will go 100 percent for war or defense. The government will get defense funds one way or another. Therefore we should start at the top, to change the policy of the leaders — we can never stop this mad arms race by cutting off our little contribution. Of course, if refusing to pay taxes for defense spending will spotlight the issue enough to change the policy, we should use it, but only after we have used all legal methods and resources, such as writing to our congressman and lobbying. Brewster Kneen, a Christian pacifist, used another means of witness. He refused to pay $72.22 in taxes he owed last year . Instead he sent a letter to the Director of Internal Revenue in Brooklyn. “The war in Vietnam,” he wrote, “is a blatant contradiction of the ideals of freedom… our country was founded upon… As a Christian and an American, I must dissociate myself from this criminal behavior… I see no alternative to withholding my tax due as a form of resistance and protest.” He sent his $72.22 to a relief group instead. 7. Should we not consider refusing to pay income taxes on the grounds of our Christian convictions concerning war, and our specific concerns about this war? This money could be sent to relief and peace-making organizations also. I think the time has come for serious discussion and action on this. Since modern armies require vast funds to operate, nonpayment of income tax is a particularly apt form of peace witness in the present situation. I, for one, would be willing to be imprisoned for nonpayment of taxes (tribute), as were the early Christians. The Friends, in England and in America, about the time of the Revolution, refused to pay war taxes, and that is what the income tax is, in essence, at present. Eighty percent of it goes for war. This we must protest! Let us instead send at least as much as we “owe” the government to be used in the work of peace and reconciliation. We urge congregations to counsel together about the proposed surcharge of 6 percent on income tax and the already imposed 70 percent of the 10 percent federal excise tax on telephone use. Since these are clearly levied to support the war in Vietnam, should not the Christian object to payment of these taxes on the same grounds as he conscientiously objects to military service? In view of the gravity of the U.S. actions in Vietnam and the kind of witness called for at this time, we urge congregations and groups within congregations to retest the validity of a law requiring conscientious objectors to pay a war tax. We urge that this form of witness be made to communicate as clearly as possible, and that those refusing to pay a war tax contribute an equivalent amount to peacemaking agencies such as MCC and in this way communicate that they seek no personal gain by their objection. We also ask congregations to adopt a resolution of willingness to support, emotionally and financially if jobs and funds are threatened, those whose conscience leads them to refuse to pay the tax increases for war purposes because of obedience to Christ. If the Mennonite witness in Washington regarding the Vietnam war is to achieve the same intensity and urgency as the Mennonite witness regarding the draft, we will need both qualified men and effective instruments of power. A Washington-based staff of politically-experienced Mennonite leaders should be charged specifically with the duty of using Mennonite influence for a decision to deescalate the Vietnam war. And this lobby should be equipped with the kind of political leverage which our threat of civil disobedience gives us on the draft issue. A parallel act would be the declaration by hundreds of Mennonites that they would refuse to pay the proposed 10 percent surcharge on the income tax, a measure resulting directly from the war. Armed with such a threat, the Mennonite lobbyist would have political power far out of proportion to his small constituency. The responses to Chris Hedges’s tax resistance article show us many examples of commonly-expressed objections to tax resistance. By examining these with an eye toward preparing persuasive answers, tax resisters can become more effective at influencing people to resist. The editor of “The Nation” spills some lukewarm praise on Code Pink’s war tax resistance campaign. Also: how not to get caught with a sucker’s refund when you file your taxes this year. Details on the upcoming NWTRCC Fall national gathering in Ohio. Also: Ken Knudson on anarchist theory and tactics. And: an update on James Stinson’s council tax resistance. “War Tax Resistance as a Human Right,” by Juan Carlos Rois, here ineptly translated into English for the first time. The Picket Line Tax Day Special, featuring a digest of tax day news. Seven war tax resisters in the UK bring a legal challenge to try to force the government to accommodate conscientious objectors to military spending. Also: the U.S. electorate — dumb as rocks, or simply spiteful? And: War tax resister John Kefalas widens his lead in the Colorado House primary to a whole seven votes. Two of the Peace Tax Seven defend the “Peace Tax” movement. Also: how we got into Iraq is a lot like how we got into Vietnam; the Palestinian resistance starts a nonviolent resistance campaign; more tales of torture from Abu Ghraib; and Najaf — not quite a Hiroshima or Dresden, but probably a Stalingrad, Sarajevo or Beirut, say U.S. troops. Jettison your misgivings by putting your money in the Conscientious Envelope. Weighing the case for a “Peace Tax Fund” — you may be able to take advantage of such a scheme already! NWTRCC Spring Conference meeting minutes, Christian criticism of the Religious Freedom Peace Tax Fund lobby, what the I.R.S.’s new private debt collection squads can’t do, and an important caveat about the retirement savings tax credit. Russell Kanning was sentenced today to time served, with no probation and no fine. Also: The Washington Post discovers dumpster diving. And: debating the merits of the Religious Freedom Peace Tax Fund Act. I hope the war tax resistance movement will eventually come to see “peace tax fund” promoters in much the same way that they currently see constitutionalist tax protesters — as people who have some overlapping interests, and who travel in similar circles, but who really aren’t fighting the same battle. Also: Donald Duck urges Americans to pay their taxes for guns, guns, and more guns. A war tax resistance article goes out over the Associated Press wire from coast-to-coast, and the Internet erupts in debate. It looks to be an interesting day. How to throw the tax system into turmoil. Also: A critique of “peace tax fund” legislation. Also: when Maine was forming its first state Constitution in 1819, the delegates debated to what extent the law should honor Quaker scruples about paying militia fines. Ruth Benn tells us more about the 12th International Conference on War Tax Resistance and Peace Tax Campaigns, and I reflect on whether war tax resisters have much in common with peace tax fund scheme promoters, or whether we’d be better off doing some outreach to other varieties of tax resister instead. Not only would the Religious Freedom Peace Tax Fund Act fail to lower the military budget, but every dollar paid into its “peace tax fund” would actually increase taxpayer spending on the military. The Religious Freedom Peace Tax Fund Act would increase taxpayer support of the military and would be a terrible blow to American conscientious objectors to military taxation — why do so many war tax resisters support it? Also: another letter from the I.R.S. Why are so many war tax resisters also fans of the Religious Freedom Peace Tax Fund Act? Part of the reason is that some of the Act’s worst flaws only showed up in recent versions of the legislation and came in under the radar. Also: some responses to my series on the Act. The most contentious item on the agenda at the NWTRCC Spring national gathering was our organization’s relationship with the Religious Freedom Peace Tax Fund Act and with the National Campaign for a Peace Tax Fund, a long-time affiliate of NWTRCC, which promotes the act. In a 1988 paper, Juan Carlos Rois gave an in-depth critique of the struggle to enshrine conscientious objection to military taxation as an internationally-recognized human right. Here is my translation of the outline of that paper. Ten years ago today, Albuquerque’s local newsweekly, the Alibi, published a feature by Singeli Agnew about war tax resisters. Here are a few excerpts. War tax resisters reflect on the anniversary of the atomic bombings of Japanese cities. Also: what if conscientious objectors’ taxes could play for something good, like the U.S. Institute of Peace? And: a 1966 declaration supporting war tax resistance from the New York Yearly Meeting of the Society of Friends. Nicaraguan tax resistance leader Irlanda Jerez is being tortured in prison. Radar destruction continues at a slower pace in France. Julia Butterfly Hill interviewed on her war tax resistance. And: what is a tax resister to do in the face of tariffs?